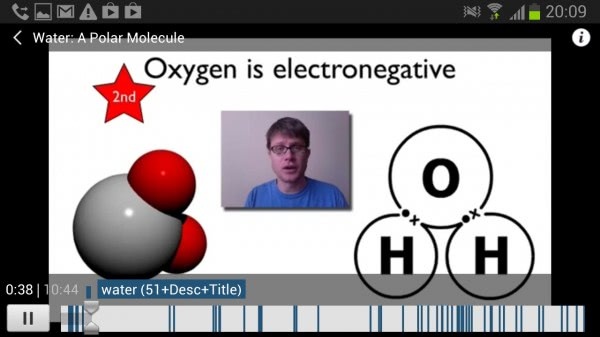 Mobento is a new video learning application for Android devices that originated out of the web service of the same name. The application makes available a selection of high quality educational videos from universities and organizations such as Stanford, Yale, NASA or the Khan Academy. What sets Mobento apart from similar applications and web services is the search module, which will not only search videos by name, description or origin, but also by the words spoken in the videos. This means that searches will also yield results where the searched word does not appear in the name or description of the video, but is mentioned by a speaker in the video. The application displays a list of recent videos on the start page, each highlighted with a small screenshot, the playing time, name, month and year as well as category it has been sorted into. A tap on the video plays the video right away on the device, while a tap on the icon on the right loads a page with a detailed description and additional information about the video. 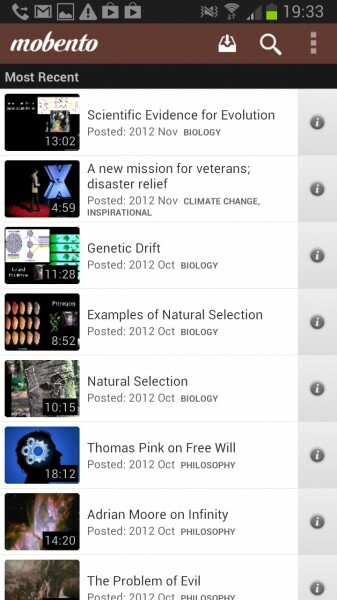 Educational videos that you select this way are streamed to the device. The three buttons at the top right open the download manager, the search and the main menu. Videos can only be downloaded if you sign up for a free Mobento account. This can be useful to download them to the device using a wireless connection to avoid lags or using all of the free bandwidth that you have to stream the videos. The main menu links to the user account and library, a listing of the most popular and most recent videos, as well as the search. It may take a couple of seconds before search results are displayed on the screen. What's interesting here is that a timeline is displayed at the bottom indicating each position of the video where the searched word has been mentioned. This can be especially useful if the word only appears a few times in a video so that you can jump right to the positions where it is mentioned. The Mobento website offers the same feature set, so that you can access the educational videos even if you do not install the app on your device, or if you do not use an Android device at all. The Mobento application is compatible with all Android 2.2 and newer devices.